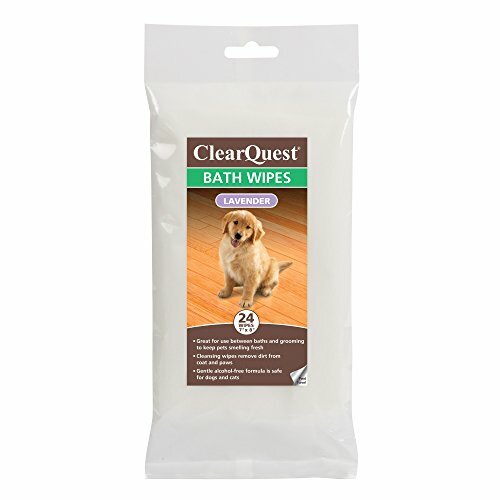 ClearQuest Bath Wipes are the perfect tool for keeping dogs and cats fresh and smelling great between baths. Convenient 24-count travel size available in all scents; 100-count pack in the Fresh Pet and Baby Powder scents. Size: Each wipe measures 7" x 8". 2. Pull wipe through package opening. 3. Wipe pet from head to tail with bath wipes. If needed carefully wipe ears and face. 4. Discard wipes after use. 5. Reseal the package after opening to prevent wipes from drying out. Keep your pets fresh and clean between baths!